Magnetic resonance transitions can be detected optically by coherent Raman scattering, a process that may be considered as a frequency shift of an optical photon. The frequency-shifted light is detected through optical heterodyning, which returns the RF signal. The aim of our work is to improve these methods and make them applicable to a greater number of systems. The reduction of the temperature by suitable laser irradiation, is a well established technique for cooling free atoms and trapped ions. Another interesting application would be the reduction of the temperature of condensed matter, specially semiconductors. Laser cooling works by using thermal energy available in the material to increase the energy of photons: the energy of the emitted photons must be higher than that of the absorbed photons. This process, known as luminescence up-conversion, can be used to realize laser cooling of semiconductors which offers the opportunity for vibration-free and direct integration into electronic and optoelectronic devices. NMR of quantum wells faces a twofold challenge: the number of spins in a layer of only a few nanometers is significantly smaller than the detection limit of conventional NMR spectrometers. Even if it were possible to detect this small number of spins, the signal would be completely covered by the much larger signal from the identical spins in the substrate. 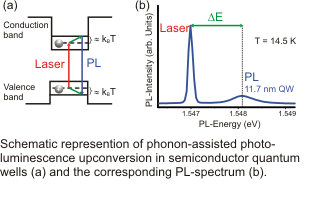 Using lasers for excitation and detection can overcome the sensitivity limit by enhancing the signal by several orders of magnitude. Furthermore, the restriction of the signal to a specific optical wavelength selects a specific quantum well, while the substrate signal is effectively suppressed. Additional details can be found here.